10 Comments As an Amazon Associate I earn from qualifying purchases. Thanksgiving is quickly approaching. 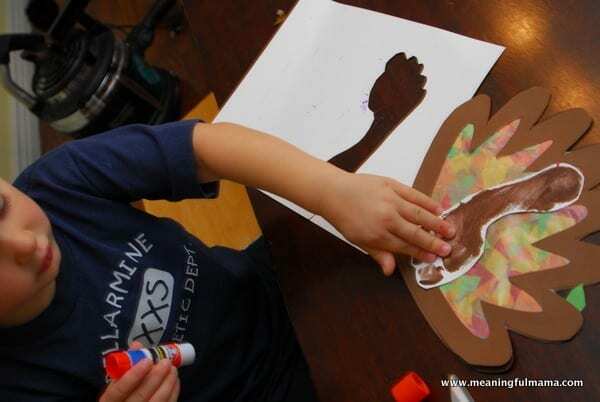 I have wanted to do a Thanksgiving turkey craft with my kids. I finally came up with an idea I was excited to try. 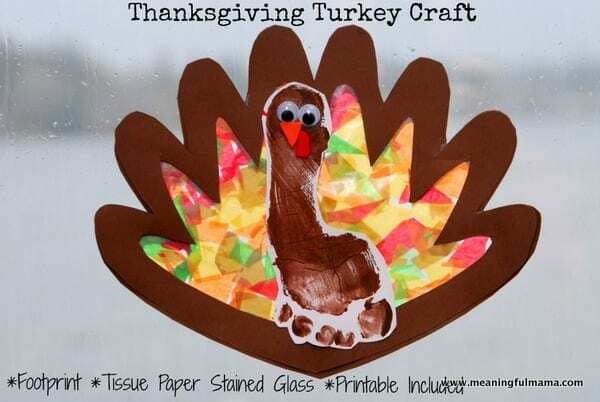 This Thanksgiving footprint turkey with tissue paper stained glass wings was built out of the desire to create something new but use techniques with which I am familiar. I really believe this craft is accessible for a variety of ages. 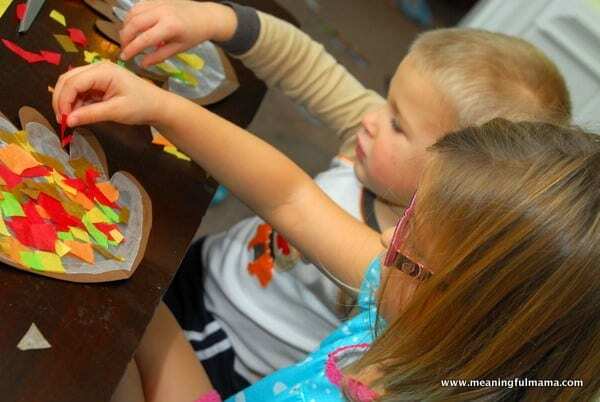 I love the results, and the kids really enjoyed every aspect of this. The first step is to paint feet. The kids really enjoyed painting each others feet. They were laughing and smiling the whole time. 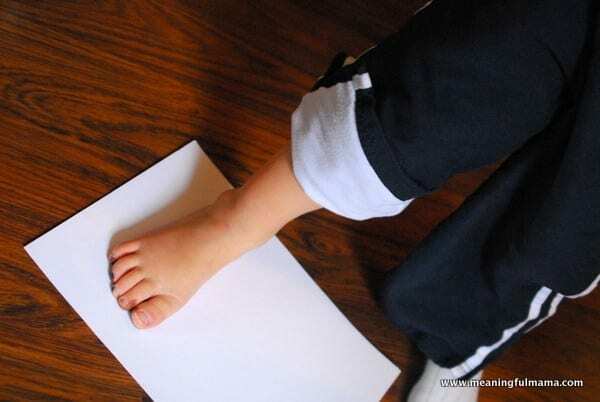 You will want to help your child stand directly onto the white piece of paper. While standing there, press down each toe and the edges of their feet to produce a good print. I then had to lift my kids up and carry them to the sink, where I washed their feet. While doing this, I reminded them of the Bible story about Jesus washing His disciples’ feet. I reminded them it is a symbol of serving others. I then had the kids fold the brown paper in half. As a reminder, you need 2 pieces of brown paper per child, and I used brown stock paper. Next, you will want to print out the feather frame printable I made for you. I had originally done it on green paper, so that’s my template you see above. 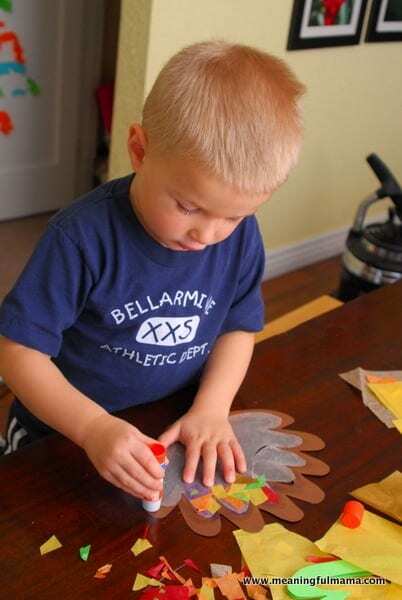 You can use the printable template or just make your own. I made it by folding a piece of paper in half and just drawing the feather outline. I then cut out the template and traced it on brown. 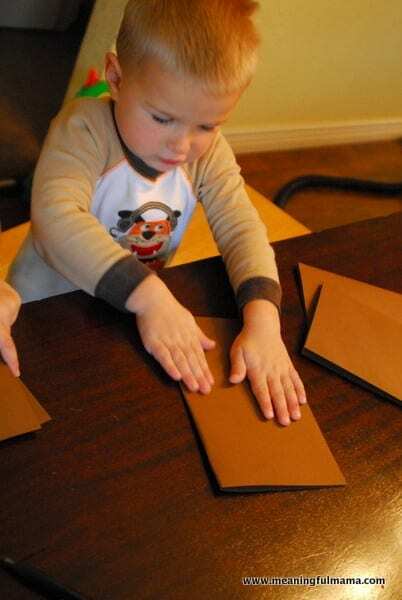 Make sure to line up the folded part of the template onto the folded edge of the brown paper. After traced, I cut the brown paper frame. I put two pieces of folded brown paper together to cut the two at the same time to make sure they line up well together and save time. 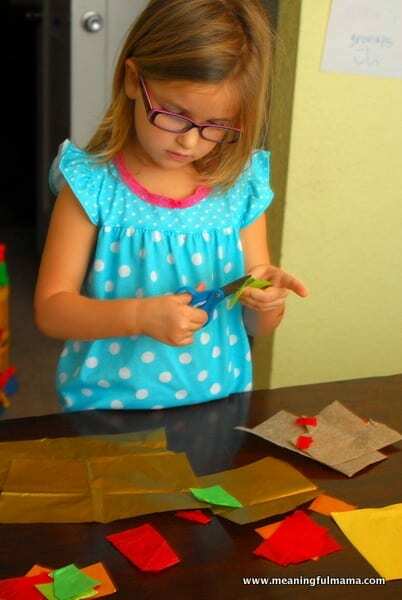 The kids worked on cutting up little pieces of fall colored tissue paper. Corban is just learning to use scissors, so this was a great opportunity to practice. 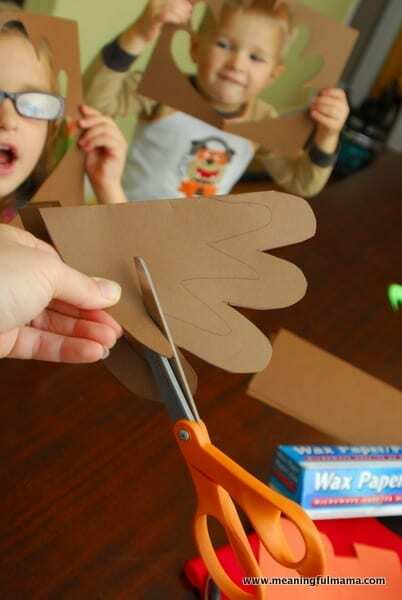 After you cut your brown “frame” for the wings, you will have the leftover inside brown paper. 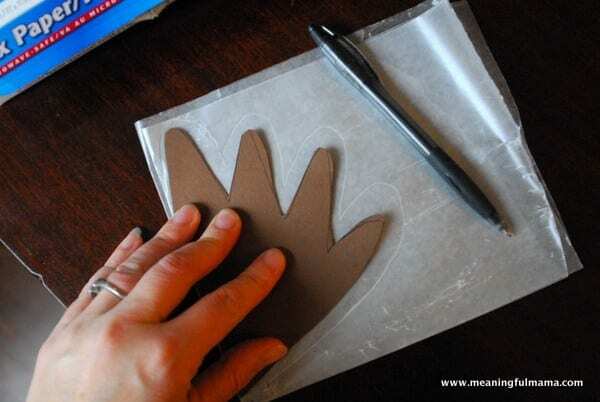 You can use that to cut the right size for your wax paper. I folded my wax paper in half. 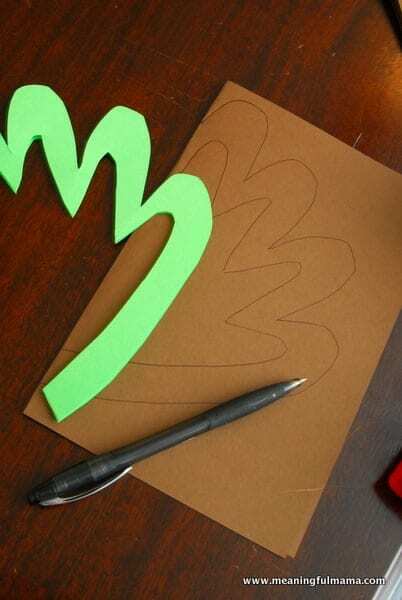 Lay the paper with folded edges matching and trace around it, tracing not exactly – but larger than the scrap piece. 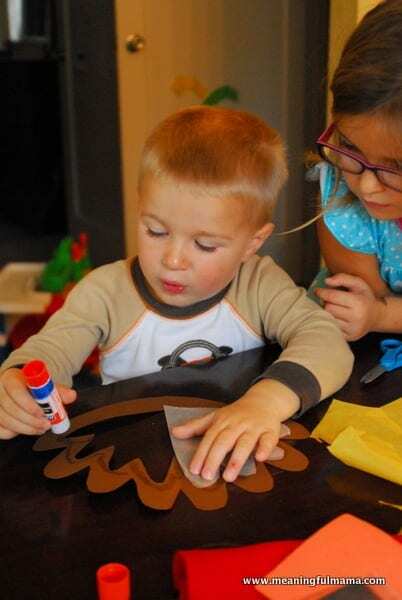 This extra will give you the overhand to glue to the “frame.” You will need two of these per child. Again, it is easiest to cut two at a time. 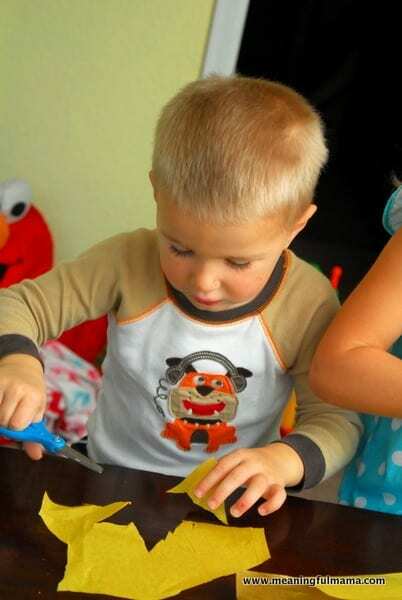 The kids can put glue around the frame. Then, you can lay down the wax paper. We did half at a time so the glue didn’t dry completely. They will want to glue one wax onto one brown feather frame at this time. The next thing they get to do is glue down the tissue paper onto the wax paper on the inside of the frame. 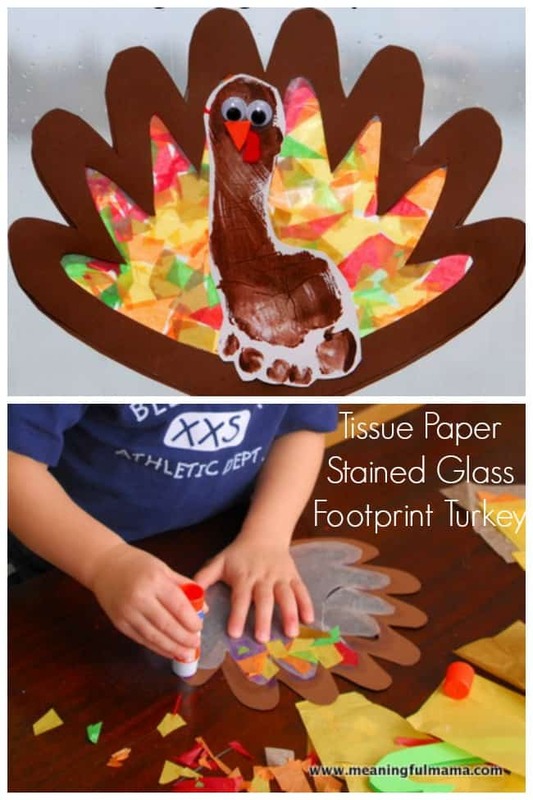 The kids can add the glue and then lay pieces of tissue paper on top of it. We used purple glue, which made it easy for the kids to see where to lay down the tissue paper. They did little sections at a time. 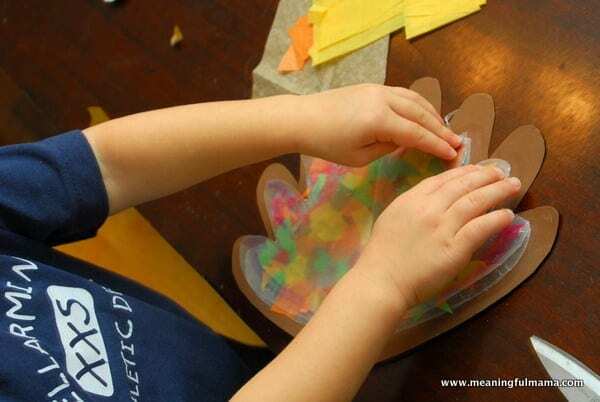 After the tissue paper is all laid down, the kids can put glue on the edges of the other piece of wax paper and glue it to the top of the tissue paper filled piece of wax paper. 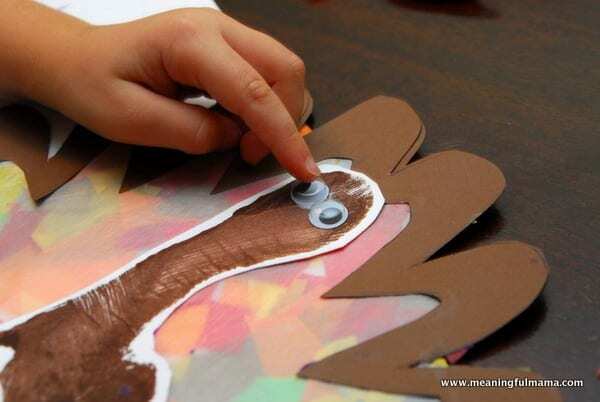 The next step is to put glue on the other brown feather frame and lay it on top to complete the look of the tissue paper feather stained glass part of the craft. Once the painted footprint is dry, the kids can glue this down to the center. It is meant to look like the turkey body. The next step is to glue down the eyes. Cut out a little triangle nose out of foam, paper or felt. I used foam. 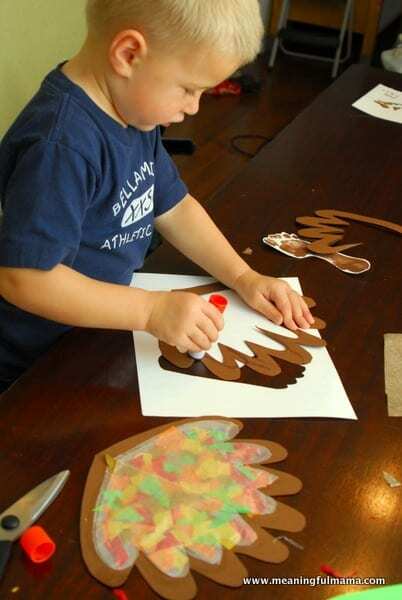 Then, gut out a gobble out of red foam, paper or felt. I used felt. 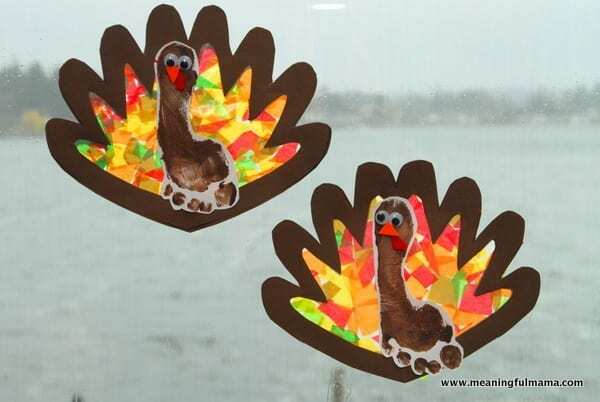 I love the result of these turkeys, and it really was a great Thanksgiving craft for preschool aged children. You are welcome. I hope you had a lot of fun with it!